The phone rang just after 11pm. It was James. And so, because documentary filmmakers are inherent busybodies, I headed down to the noodle shop near where we live. I wasn’t prepared for what I saw. Two fire engines blocked the road outside the shop. There were police cars everywhere. A chattering crowd lined the street. Some people, like us, were there to gawp. But a few appeared genuinely traumatised. They looked dishevelled, lost, as if they had just crawled out of bed. A group of women stood around in their PJs. Several had suitcases with them. It was a bewildering sight. Bits of conversation drifted past us and gradually, things started becoming clearer. 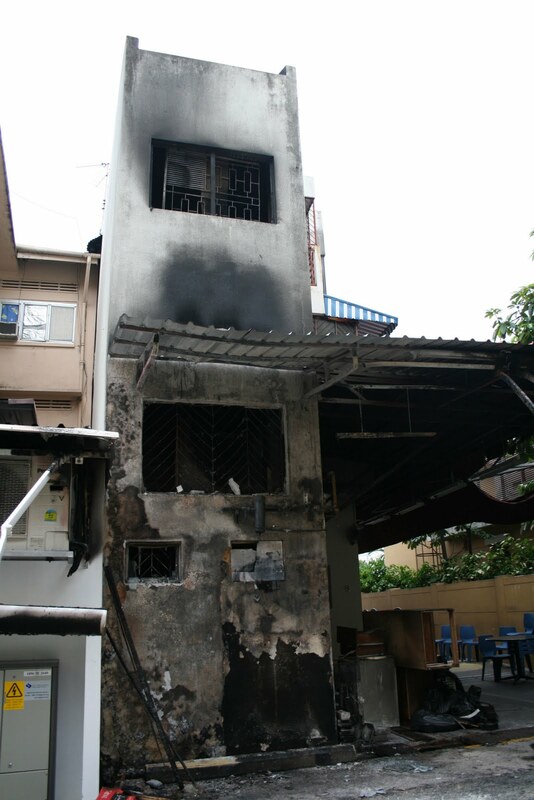 A gas canister had exploded, causing a fire. No one was hurt. 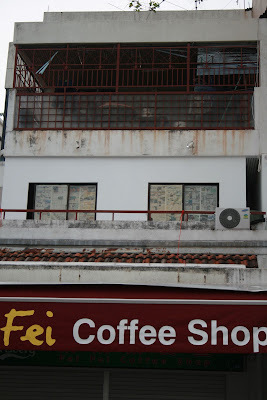 But residents living in the two apartments above the shop were not allowed to go back in because of the poisonous fumes. It was then that we realised why so many people had their luggage with them. They were migrant workers from China. And they must have been in the two apartments when the fire broke out. I did a quick count. There were at least 20 of them. A neighbour who had heard the explosion and called the police, told us later that he was shocked to see so many people emerging from the windows of those apartments. The fire, we were told, had spread very quickly, cutting off access to the staircase leading to the exit. Scores of people were trapped. Some were so desperate, they wanted to jump. Eventually workers from a nearby coffee shop arrived with a ladder and were able to help everyone leave the two flats safely. I visited Fei Fei again with a friend today. It was shut. There was a charred table up front, piles of half-melted plastic chairs next to it. Out back, we saw just how big the fire must have been. An entire wall was caked in soot. But what really shocked us was what we saw inside. 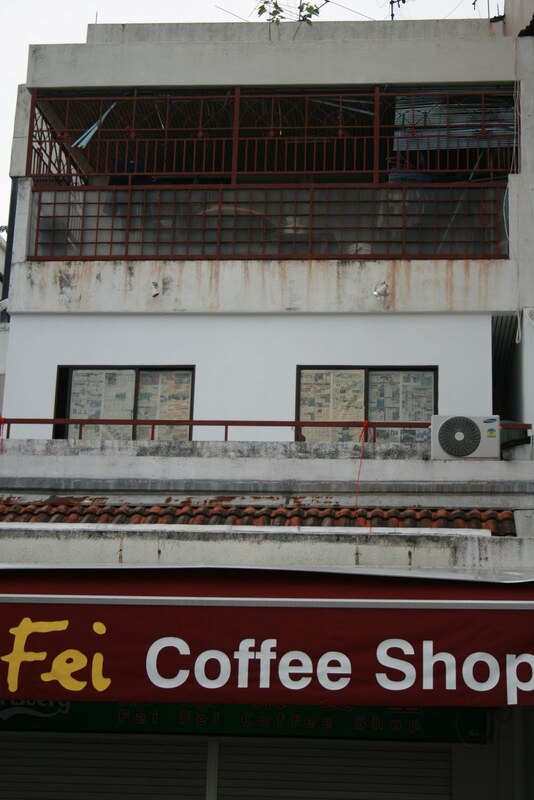 I had long suspected that the flats were being used as dormitories for migrant workers. Today, we had confirmation. 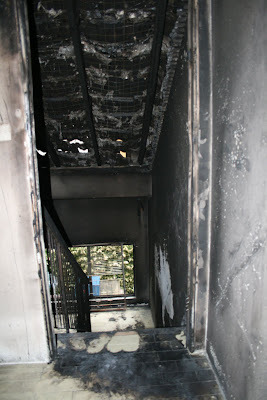 A blackened stairway that still smelled of smoke led up to the two apartments. Inside, it was like a maze – plywood walls, various padlocked doors, and dark, pokey passageways. The landlord had sub-divided the space into smaller units in a bid to pack in as many people as possible. He had even converted the area under the stairs into a tiny room. 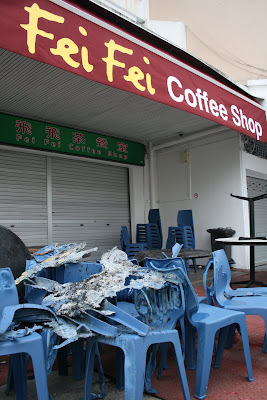 No one was hurt in the fire at Fei Fei that day. That’s primarily because the explosion happened as the shop was closing. The fire department also did well to arrive on the scene so quickly. Things could have been so much worse. What if… what if… there had been customers sitting next to the gas cylinder? What if the flames had been bigger, the winds stronger? What if the balcony had been blocked? What if those men hadn’t shown up with the ladder? Still, it seems not many people are expecting a repeat of the same disaster. Some workers have already moved back into the flat. And who can blame them? Where else would they go?